www.stma.org March 2017 | SportsTurf 11 The AVANT ATA 1200 Turf Cleaning Solution Keeping your sport surface properly maintained is essential for optimal playing conditions and extended turf life. The ATA 1200 gently and thoroughly sweeps turf fi bers while simultaneously cleaning, screening, and re-depositing infi ll back to the turf in a single pass removing course debris, fi ne particles, dust and broken fi bers that compromise the integrity of the entire sport surface. The Avant compact, articulating loader with the ATA 1200 makes fi eld maintenance fast, a• ordable and e• cient. 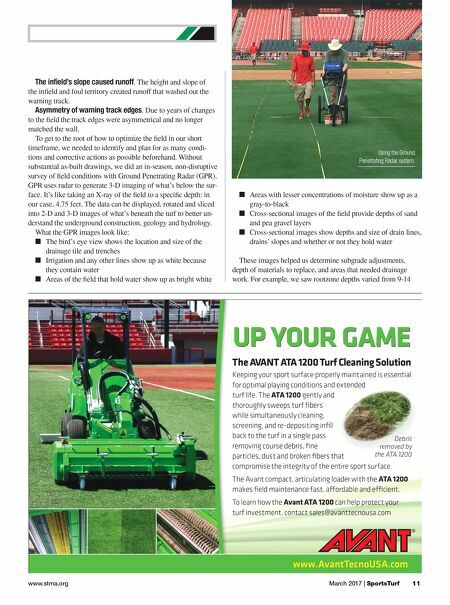 To learn how the Avant ATA 1200 can help protect your turf investment, contact sales@avanttecnousa.com UP YOUR GAME Debris removed by the ATA 1200 for optimal playing conditions and extended gently and screening, and re-depositing infi ll particles, dust and broken fi bers that Debris removed by the ATA 1200 Debris www.AvantTecnoUSA.com AVT_012 Turf Ads v4-M.indd 1 11/7/16 3:50 PM The infield's slope caused runoff. The height and slope of the infield and foul territory created runoff that washed out the warning track. Asymmetry of warning track edges. Due to years of changes to the field the track edges were asymmetrical and no longer matched the wall. To get to the root of how to optimize the field in our short timeframe, we needed to identify and plan for as many condi- tions and corrective actions as possible beforehand. Without substantial as-built drawings, we did an in-season, non-disruptive survey of field conditions with Ground Penetrating Radar (GPR). GPR uses radar to generate 3-D imaging of what's below the sur- face. It's like taking an X-ray of the field to a specific depth: in our case, 4.75 feet. 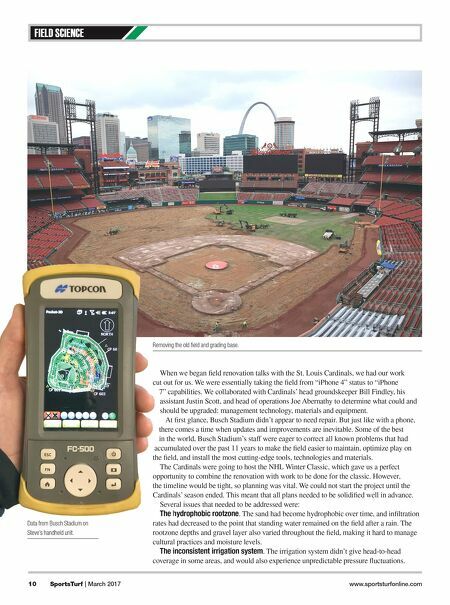 The data can be displayed, rotated and sliced into 2-D and 3-D images of what's beneath the turf to better un- derstand the underground construction, geology and hydrology. What the GPR images look like: ■ The bird's eye view shows the location and size of the drainage tile and trenches ■ Irrigation and any other lines show up as white because they contain water ■ Areas of the field that hold water show up as bright white ■ Areas with lesser concentrations of moisture show up as a gray-to-black ■ Cross-sectional images of the field provide depths of sand and pea gravel layers ■ Cross-sectional images show depths and size of drain lines, drains' slopes and whether or not they hold water These images helped us determine subgrade adjustments, depth of materials to replace, and areas that needed drainage work. For example, we saw rootzone depths varied from 9-14 Using the Ground Penetrating Radar system.